For each patient, the end of follow-up was defined as July 1997 in patients for whom follow-up was available, the date of death, or the date after which the patient was unavailable for follow-up. The number of patients per follow-up interval is given in Figure 1. The outcomes of the 56 patients who underwent bronchial arteriography are presented in Figure 2. Of the 46 patients who underwent BAE, immediate arrest of hemoptysis was obtained in 43 patients (77% of initial 56 patients). BAE failed to control bleeding in three patients. Of these latter patients, two had a contraindication to surgery (nonsurgical lung carcinoma in one patient, impaired function in the other) and died at day 1 from uncontrolled hemoptysis add comment canadianneighborpharmacy.com. An emergency pneumonectomy was performed in the third patient (Fallot tetralogy), but he eventually died 1 month later from recurrent hemoptysis from the opposite side. 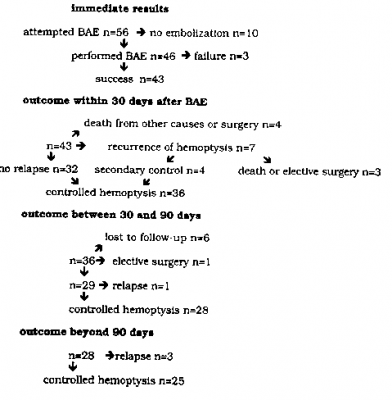 Of the 43 patients with immediate control of bleeding after BAE, 2 patients died from causes other than hemoptysis, 2 patients underwent elective surgery, and 7 patients suffered relapse of bleeding, Thus, 32 of the initial 56 patients (57%) were managed successfully by BAE without recurrent bleeding for 30 days.